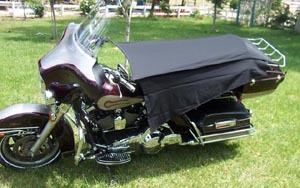 Protect your Electra Glide at home, at work or on tour! Gauge Cover, windshield 2" to 8"
Gauge Cover, windshield 8" to 24"
Grommet for above covers for AM/FM or small CB size antenna, 3/4 inch dia. Grommet for above covers for early model large CB size antenna w/coil, 1 inch dia. 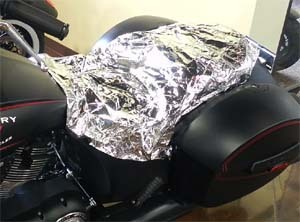 The product idea came from watching fellow bikers put towels, helmets, & jackets on their seats to help keep them cool and dry. 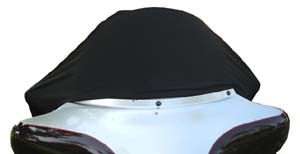 The material itself is a layered metalized polyester. 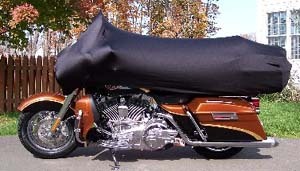 The incredible poly film is layered with UV protectant and several clear laminates for strength and heat-resistance and finally fused to a soft, non-woven, fabric-based backing. They are sewn with braided elastic, inspected, packaged in their special micro-fiber pouches. 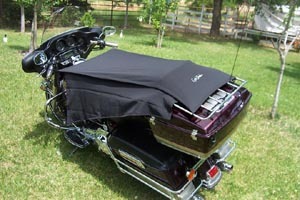 Keeps saddles cooler. 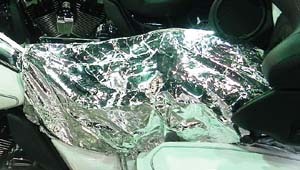 An unprotected seat can reach temperatures over 150º. Seats rarely get warmer than what an outdoor thermometer would read. 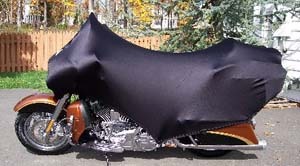 Keeps saddles dry. Water-proof, although we say it is water-resistant. 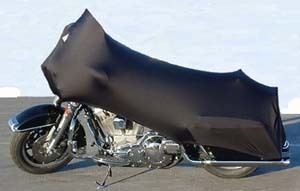 This is because the metalized polyester side is water-proof, but the fabric backing can and does absorb water. 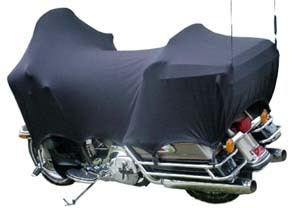 Under normal conditions, the backing will not be exposed to rain, dew or moisture. 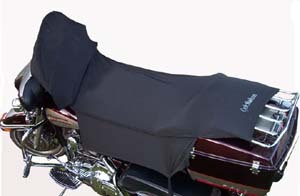 Protects saddles from fading and cracking with exposure to the elements over time. 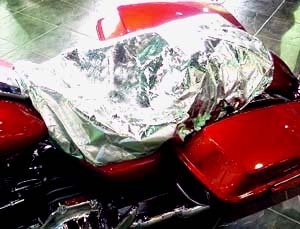 Minimizes the need to treat saddles with leather or vinyl conditioners, and helps protect from damaging salt spray near oceans and salt lakes. 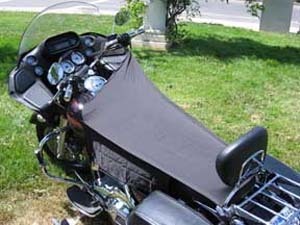 Very inexpensive way to stay protected. Compact. Stores in minimal space. About the size of a soda or spray paint can. Drawstring micro-fiber storage pouch doubles as a glasses cleaner or protective bag for sunglasses. 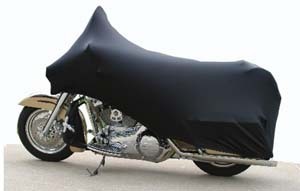 CAS-L: Our most popular and most ordered size for motorcycles. Over 60% of worldwide sales are for the CAS-L. 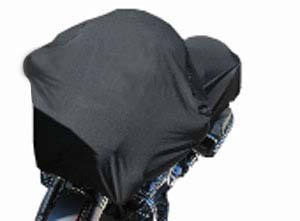 This is the right fit for most Harleys, including Road King, Heritage, V-Rod and Dyna. 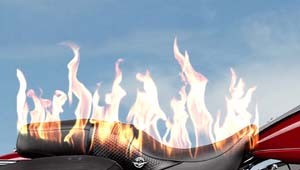 Also, buy the CAS-L for Honda cruisers, including 1300 and VTX 1800, as well as nearly every Yamaha Star and Kawasaki Vulcan, to name but a few. The CAS-L measures about 22" x 31", when laid flat, with a drawn elastic perimeter of about 56". Average depth is roughly 5". If the distance around your seat is between 60 and 102", the CAS-L may be the best fit! 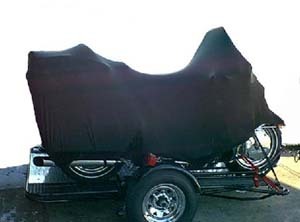 CAS-EX: This is the size that fits the really large dual queen and dual king saddles; like on Harley Electra Glide Ultras, Goldwings*, Yamaha Royal Venture and most other large v-twin touring bikes. 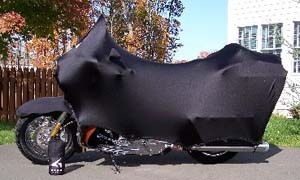 This also fits the Spyder ST, RS and RT, along with most large sport bikes like the Honda NT 700V. The CAS-EX measures about 26"x 39", when laid flat, with a drawn elastic perimeter of about 80". Average depth is roughly 6". If the distance around your seat is between 80 and 130", the CAS-EX may fit the best! 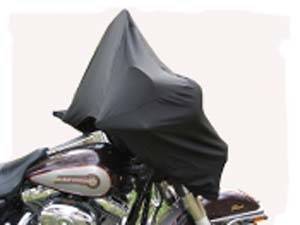 * Fits the bottom portion of saddles, not specifically designed for the passenger backrests or large driver backrest configurations. 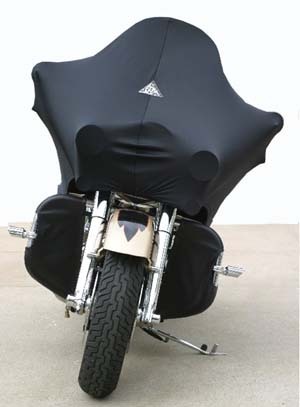 Pro-Stretch Motorcycle Covers are truly unique. 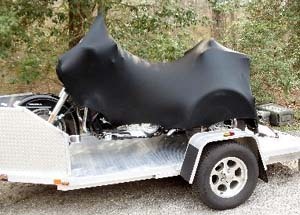 Not only are they True Custom Made in the USA to perfectly fit your exact Harley Davidson model, but they are also designed for towing on an open trailer while still being compact and portable for daily use and traveling. 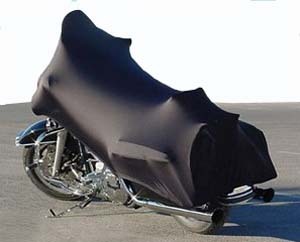 Every cover is cut and sewn from patented designs and meticulously constructed from one solid piece of patented fabric to achieve a flawless and protective form fit. Special order item, as we make them up per customer order. Note: Between March and August it can take between 3-4 weeks to make up the covers, unless it is a special rush request. 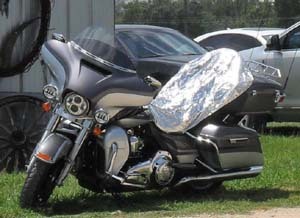 Now also available for the Harley-Davidson TriGlide. Antenna openings: GZ-SB1, GZ-SB2, GZ-SB3 and other models come complete with a simple procedure to add antenna opening where needed. We do this so that the customer can precisely position the openings on the larger covers...to account for tour-pak luggage racks, etc. 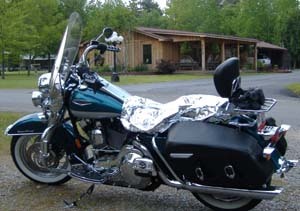 We have options to fit Electra Glides, Road Glides and Road Kings with saddlebags, and/or tour-packs. 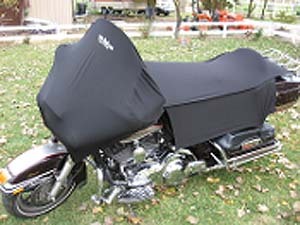 Further, you have a choice of three patented high performance materials to have your cover built from. This way, not only do you get an exact fitting cover, but you also get a cover made from the ideal material of your choosing to meet your exact needs. Blocks 98% of UV Rays. 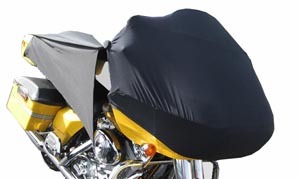 Can withstand winds up to 65 mph without flapping or rubbing. 100% anti-static. No worries around fuel vapors. 4 year warranty on fabric and all stitching. 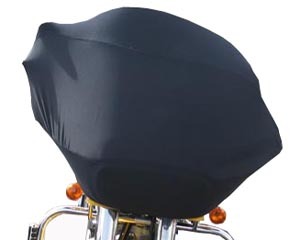 Protect your motorcycle seat from sun damage, moisture, bird droppings and sap. 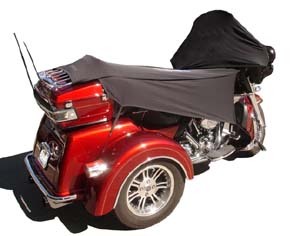 The Shade adds years to the life of your seat, keeps it cool, and looks cool! Put helmets out of sight and out of the sun. Detours people and kids from sitting on your bike! Rolls up small to fit in it's own compartment. Made from quality materials. Shades made to fit touring bikes with or without tour-pak. 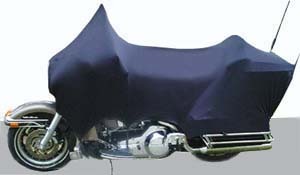 Combo models with shade and gauge cover. GC-6: windshield 2" to 8"
GC-13: windshield 8" to 24"
GRT-AMFM: Grommet that can be added for one AM/FM antenna or small similar diameter CB shorty antenna. Installation instructions provided. GRT-CB: Same as above for early model year large CB antenna w/coil. Get off the Hot Seat!